Overview: BACAHS celebrates our legacy by clearly identifying ourselves as a chapter of the American Harp Society through our distinct logo that anchors our comprehensive website, BACHARP.org, and informative newsletters that are brimming with member news, event announcements, instructive columns and classified ads. These communications facilitate the mission to share information and promote and foster the appreciation of the harp, thus inspiring excellence for all. Our blog and annual calendar of events show more of the same, announcing harp recitals, both by our members and other visiting artists, as well as workshops and master classes. These serve to further harp education at all levels, as well as empower the next generation. Summary of Activities: In June 2015, the board sent out a survey to members and friends to learn how the chapter can be more valuable to them. Seventy people completed the survey. The overwhelming response demonstrated keen interest and enthusiasm for the chapter and its activities. In October, BACAHS kicked off the year by presenting an afternoon with Ann Hobson Pilot, at our local harp store and community partner, Harps Etc. The program began with a screening of her documentary, Harpist’s Legacy – Ann Hobson Pilot and the Sound of Change, after which she shared the story of her life in music, answering questions from the inquiring crowd. To cap off the event, Ms. Hobson Pilot performed the cadenza from On Willows and Birches, the concerto written for her by John Williams. The day was magical and a true gift from this great harpist. January brought the annual Winter Potluck in San Francisco. This event is always well attended since members love to get together after the busy holiday season to share ideas and experiences, and to meet new harp friends. Each year, a member harpist is the featured entertainment. This year, Destiny Muhammad, Sound Sculptress, from Celtic to Coltrane, inspired the group through harp and song with her personal story of empowerment, spirituality and musical achievement. Also included, for the first time, was a Music Swap, where people brought music they no longer needed and others were able to find scores for pieces they were ready to play. From left to right: Chapter officers: Henry Heines, Secretary; Alice Yothers, President: Melinda Chinn, Treasurer; Susie Spiwak, Vice- President. Member Natalie Cox and her Pacific Arts Trio, performed a concert in February. Their program, Classical Flamenco, was well received by a packed house at Harps Etc. In order to attract a broad audience in addition to the harp community, the program was promoted through social networks and meet-up groups. One third of the attendees were from outside the harp community, which fostered new appreciation of the harp as a musical instrument for many. Early in April, BACAHS shared HarpLive! with the Silicon Valley Chapter. This lovely event is held annually to foster relations between the two chapters and encourage performance in a comfortable and supportive environment. One week later, Julia Kay Jamieson came to San Francisco to present a workshop on improvisation, followed by a concert of her own compositions and arrangements. Julia educated, inspired, empowered, and entertained harpists and non-harpists alike. Her “Fearless Improv” workshop was attended by beginning harpists, experienced amateurs and professionals. Auditors included harpists, teachers and members of the public. Her evening recital was attended by seventy-five harpists and music lovers from the Bay Area. During the concert, Julia explained and demonstrated the diversity of the harp in ways that many had never experienced. All were captivated, awed by her footwork and entertained by her performance. Julia further engaged the harp community by inviting local professional members to perform with her two of her ensemble compositions. Members peruse music swapped at the BACAHS Winter Pot Luck Supper. From left to right: Lucy Agee, Wendy Sharp, Brian Swager, Suki Russack. Member harpists with harps for sale were invited to showcase their harps throughout the day. Some of these harps were available as loaners for people who could not bring their harps to the workshop and all were on elegant display in hopes of finding their next musical homes. New this year, BACAHS held a spring social in the North Bay (a new location for the chapter in an effort to meet new members) at the home of board member Henry Heines. Member Naomi Hoffmeyer, who is preparing for the USA International Harp Competition, performed a recital of some of the repertoire. The event was open to members and their family and friends. 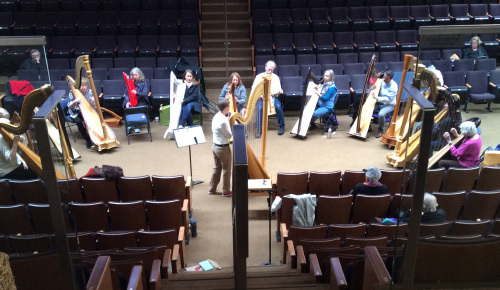 The turnout for this recital in the country was equally divided between harpists and non-harpists alike, furthering the outreach for fostering appreciation of harp in the Bay Area. There is more to come: In partnership with Silicon Valley Chapter and the Peninsula Jewish Community Center, BACAHS will present Yuying Chen, winner of the 2015 International Harp Contest in Israel, in recital in June. Additionally, Ms. Chen will present a master class. The location of the venues was chosen to enable easy access for members of both chapters, so to encourage future collaboration between chapters. New this year: Member Spotlight in our chapter newsletter. The diversity and depth of membership in the chapter are something to be celebrated. When a member has an achievement, it is shared with the group. Member Spotlight this year has featured people who have released new CDs, joined the board, and prepared for a major competition, to name just a few. Bay Area Harpists learn they can create music from their own imaginations at the Free Improv workshop with Julia Kay Jamieson. Bi-annual Competition: BACAHS enrolled sixty-eight members in 2015-2016. The membership swells by an additional twenty to twenty-five student members in odd numbered years when the Yvonne LaMothe Schwager Competition for Young Harpists is held. This competition is an opportunity for students under the age of twenty-five to experience the preparation for competition, compete for cash prizes and earn the opportunity to perform at a winners’ recital. In the off year, the chapter continues to communicate with and offers encouragement to prospective participants. The next competition will be held in May 2017.